Safe-Wâ Boiler Gaskets are made from EPDM rubber steam material in ¼” thickness. Virtually all sizes and styles are in stock for delivery. 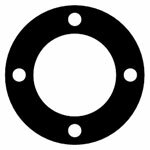 Topog-E® Boiler Gaskets are made from EPDM rubber steam material in ¼” thickness in molded or die cut. Virtually all sizes and styles are in stock for delivery. Blue-Max Boiler Gaskets are made from tacky cloth of glass, synthetic fibers and brass wire impregnated with a blue elastomer compound material with a PTFE coating in ¼” thickness. Virtually all sizes and styles are available. Spiral Wound Boiler Gaskets are made from metal windings with a filler of Graphite, PTFE, or Non-Asbestos material in .187” thickness. Virtually all sizes and styles are available. These gaskets are made in 150 lb., 300 lb., 400 lb., 600 lb., 900 lb., 1500 lb., and 2500 lb. ratings. The sizes range from ½” up to 96” in diameter (ID). Materials used in flange gaskets are Buna-N, Durlon 9000 (filled PTFE®), Graphite Flexible, Non-Asbestos, Red Rubber, Sealex® (Expanded PTFE), Spiral Wound, PTFE®, Silicone, Flouroelastomer and others. 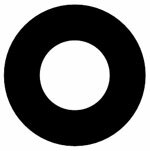 RF gaskets are a ring (OD x ID) gasket with no boltholes. Usually the gaskets are made in thicknesses of 1/16” or 1/8”. Materials will vary according to the application with non-asbestos being the standard in your pipeline flange. 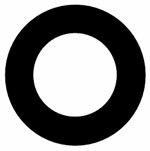 FF gaskets are a ring (OD x ID) gasket with boltholes. Usually the gaskets are made in thicknesses of 1/16” or 1/8”. Materials will vary according to the application with non-asbestos being the standard in your pipeline flange. XH gaskets are usually a ring (OD x ID) gasket with no bolt holes and a wider wall than the standard RF gasket. Usually the gaskets are made in thicknesses of 1/16” or 1/8”. Materials will vary according to the application with non-asbestos being the standard in your pipeline flange. HECK KIT gaskets are a ring (OD x ID) gasket with bolt holes. 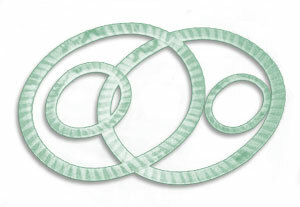 Usually the gaskets are made in thicknesses of 1/16” of filled PTFE®. Finally, a product designed for high temperature district heating systems to ensure dielectric isolation of cathodic protection systems. 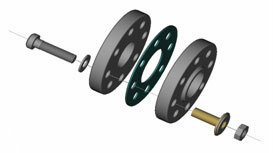 Standard sizes are available for all applications from 1” to 12” in 150 lb. to 600 lb. ratings. Kits include gasket with isolated washers and sleeves combined for the pressure and temperature resistance needed with ease of installation.